Find hotel near San Colombano - Collezion .. This delightfully re discovered church with original frescos and paintings hosts a wonderful collection of over 80 musical instruments assembled by Luigi Tagliavini. 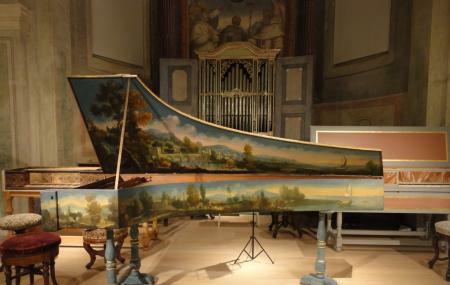 Many of the assembled harpsichords, pianos and oboes date back in 1500s and are fully functional! The church and the monastery still retain a great ancient painting representing the Virgin with St. Columban and other saints.The collection consists of 70 ancient musical instruments in all across 16th to 20th century of both Italian and roman schools of music. All of this is a result of effective restoration by Arnaldo Boldrini and Renato Carnevali. Some of the unique instruments such as crystal piano by joseph biogno, the dulcitone, pitch fork and a group of automatic instruments. Music enthusiast or no, one should witness the baroque music concerts and musical afternoons that are a part of Genus Bononiae. A artistic museum articulated in the history center of Bologna. The free audio guide makes it easy and engaging for the visitors as it has detailed songs in both Italian and English. The walking tour gives you an enchanting feeling with the beautiful frescos, exclusive instruments on display and the audio guide giving you a glimpse of the melodious music they can create! Strollers are not allowed inside. Teenagers up to 18 years. 1 tour leader per group over 15 people. 2 tour leader per class. Journalists on the register with valid card. ICOM members - International Council of Museums. How popular is San Colombano - Collezione Tagliavini? People normally club together Oratorio Di Santa Cecilia and Basilica San Francesco Or Chiesa Di San Francesco while planning their visit to San Colombano - Collezione Tagliavini.